Neighbors living close to Spy Hop Production’s‘ Adam Sherlock might have been wondering just he was up to with a long string of headless puppets he had hung in his yard. 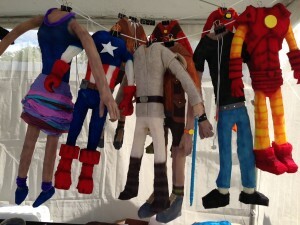 Despite the lack of faces,one could easily discern the puppets were of very familiar pop culture icons, comic book heroes, and other characters. Inspired by the ‘human puppet’ elements that were one of the most successful aspects of the Broadway version of ‘The Pee-wee Herman Show,’ Sherlock created the interactive Spy Hop version for the Urban Arts venue at the Utah Arts Festival. Spectators – in singles, pairs, or trios – select their puppets, choose a song from a karaoke list, poke their head through a green felt backdrop, and others manipulate the puppets for dancing. 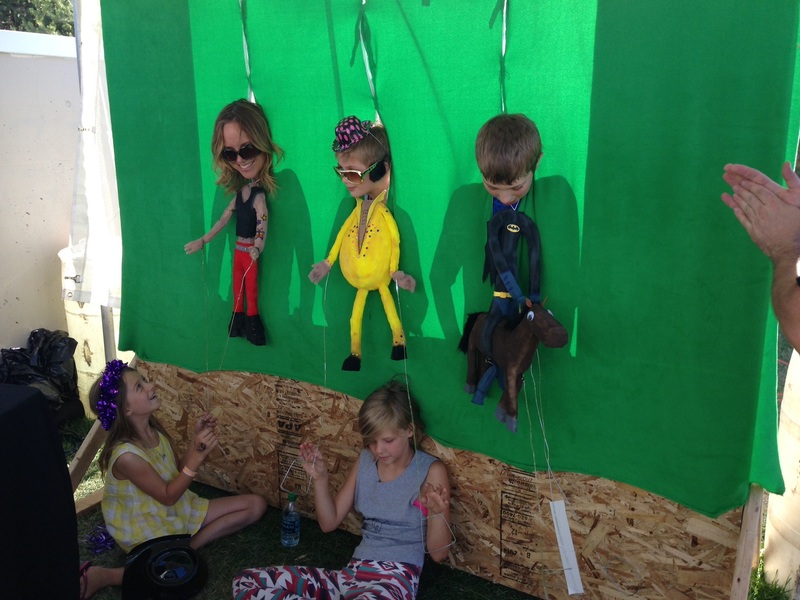 Then, spectators can choose a backdrop for their green screen video, and they have a fun memento of the festival. The activity drew a steady stream of children and adults on Saturday, Sherlock says, adding that the combo of outsized heads and puppets never loses its edge to be funny. The technology to pull this off also is ridiculously simple, Sherlock says. With Adobe After Effects, one easily imports objects into scenes without re-rendering. 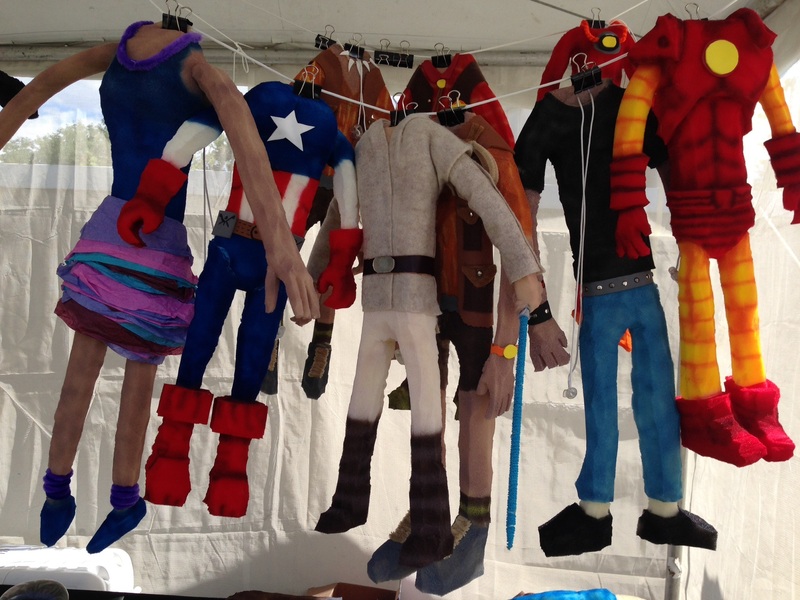 Spy Hop’s Adam Sherlock created plenty of puppets for the organization’s ‘interactive ‘human puppet’ activity at the Utah Arts Festival’s Urban Arts Venue. One of the reasons students are consistently so successful at the nationally acclaimed Spy Hop Productions in Salt Lake City is their mentors challenge students to never fear the risk of failure as they seek to be original in their creative expression. Perseverance always counts. Mentors embrace the philosophy, too. The ethic starts from the objective of making everything from scratch, whenever possible. The last several years, Spy Hop has created easy, non-intimidating interactive events for its festival booth. Last year, it was a music mashup tree. Players press any key randomly on a keyboard, which brings up a sample loop of melody or beat from a catalogue of 75 different songs – covering classics and contemporary hits from all forms of pop, rock, metal, jazz, reggae, rap, hip-hop and more. If all keyboards are played, three users can create an instantaneous mashup, using their own trial-and-error approach to make dissonant or clashing sounds meld together into fresh material. The mashup tree has been used in some other programs, including those involving refugees who recently have arrived in Utah. In other years, Spy Hop gave spectators a hand in trying stop-motion animation.